Now there is a cool Doctor Who Tardis and the night sky blanket. The Doctor Who blanket is 45 x 60 inches and is made from 100% polyester fleece making it nice and warm while looking amazing. 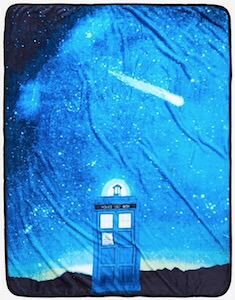 On the blanket you can see the Tardis just parked smoother and in the background you see the night sky with lots of stars and maybe even something burning while entering the atmosphere. A nice fleece blanket like this is great for use at the bed, couch, or even a picnic in the park. If you are looking for a fun Doctor Who present for a true fan then a blanket always comes in handy.